Paragliding is a recreational and competitive flying sport. A paraglider is a free-flying, foot-launched aircraft. With a paraglider, you can fly like a bird, soaring upwards on currents of air. In west Sumatra, you can find this challenge sport. 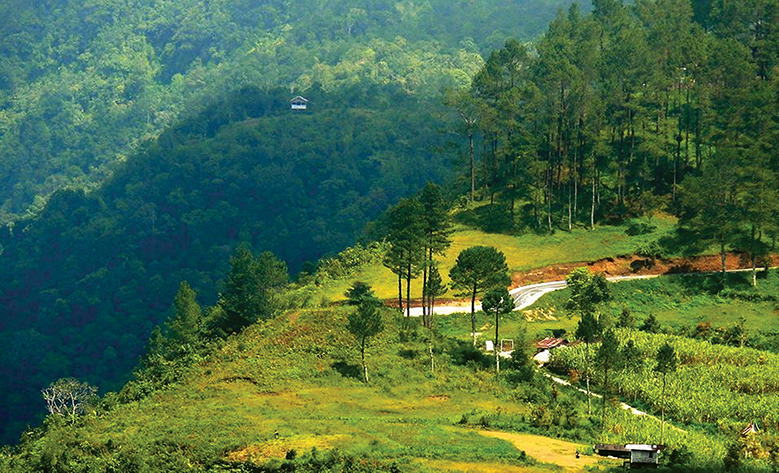 Paragliding sports held at Puncak Lawang is located at an altitude of 1210 m above sea level. This place is one of the objects of the tourism visited paragliding that many tourists, both domestic (local) and foreign. 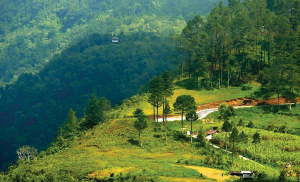 Situated in Tanjung Raya, Agam regency, West Sumatra Province. 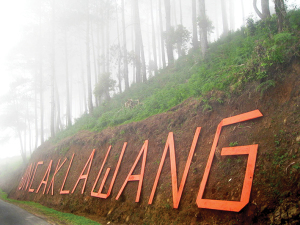 Given the place that is located above the height of the natural scenery of Maninjau Lake in the valley so spellbind, the area of Puncak Lawang on the location of the start (Take Off) sports. Thus, the pilot, while hover in the air, can see the beauty of Maninjau Lake. 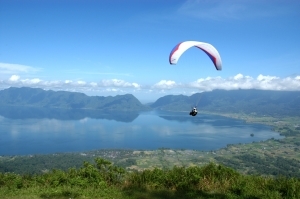 S tart location which is 1210 m from the surface of the sea or right on the hill that encircle Lake Maninjau make this place challenging the paragliding sports. With the altitude, the pilot can fly on the air while enjoying the beautiful panorama of Lake Maninjau. Beautiful scenery offers natural fusion between the green mountains that encircle the lake extends to the broad sheen of water that turn, extend the carpet of rice field area. In addition, the effect of heating the water of Lake Maninjau, give effect to the position of the glider pilot, that is able to bring the pilot to fly higher than the take off location. This location can be reach by land transportation. The journey starts from the city of Padang Pariaman path through the Lubuk cone (the capital of Kabupaten Agam), passing through Lake Maninjau and flexure 44 with the time of the approximately 2.5 hours. Lake Maninjau is a volcanic lake that is located at 461,50 meters above the sea level. Its width is 99, 5 km2 with 4, 95 meters of the maximum depth. The existence of Lake Maninjau has created a folktale called “Bujang Sembilan” (The nine bachelors). People living around the lake believe that those nine bachelors are real. Once upon a time, there was a family consists of nine bachelors and a beautiful girl named Sani. There was a man named Sagiran who loved her, they love each other until one day they were accused of doing contemptible thing by the bachelors. In order to prove the bachelors’ assumption, both Sani and Sagiran jumped into the cauldron of Mount Tinjau. Before jumping into the cauldron, they swore that the mount would not explode if they did that contemptible thing, otherwise, the mount would explode if they did not do it. Finally, there was a huge explosion causing a big hole that was fulfilled by water that is believed as the cause of the existence of Lake Maninjau. The Maninjau Lake is watering the river of Batang Antokan, and at the upstream of Batang Antokan there is a hydro power plant of Maninjau. Puncak Lawang/ The Peak of Lawang is the highest hill in Maninjau Lake area. And if you come from Bukittinggi city to Maninjau Lake, you will through the famous Veers, named the 44’s Veer, cross along 10 KM from Ambun Pagi till Maninjau. Maninjau has shinny turquoise water with the flapping leaves of coconut trees and hills around the lake that make a wonderful view in Lake Maninjau. There are two alternative ways to reach the destination, from the east and from the west. If you choose to start it from the west, it will be started from Padang to Lubuk Basung (the capital of Agam district) passing by Pariaman city. It spends about a half an hour hours by land using any accessible public transportation or chartered car that can be easily found there. It will be started from Padang to Bukit Tinggi continued to the destination passing by Kelok 44 for approximately three hours if we choose the alternative way from east.